Short Load Concrete is dedicated to saving you valuable time and money on your commercial concrete construction, replacement, or repair project. For the last 18 years, our skilled concrete specialists have supplied hundreds of thousands of yards of concrete for commercial and municipal clients across the Inland Empire, Los Angeles, and Orange County. 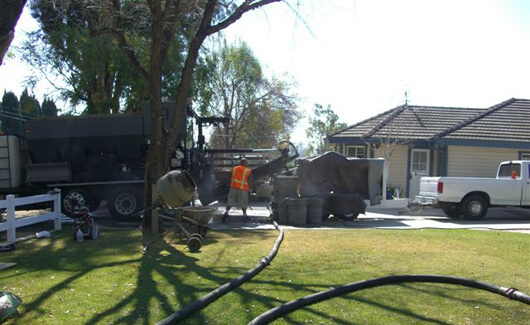 Whether fulfilling the concrete delivery needs of the California Department of Transportation, contractors, or do-it-yourselfers, clients rely on us because we provide the best value for quality service and fresh concrete delivered in a timely manner. With our large fleet of first-rate short load volumetric concrete mixing trucks, courteous, well-trained drivers, and 24/7 radio dispatch, you can trust Short Load Concrete to satisfy your municipal and commercial concrete delivery needs. Short Load Concrete freshly mixes concrete at your preferred location according to your specifications when you are ready to receive it. We can even mix concrete at intermittent intervals. Our concrete is quality tested and approved by CalTrans, and is used in a diverse range of commercial and municipal jobs, including highways, foundations, pipes, sono-tubes, building walls, roadways, pathways, parking lots, pourbacks, and sidewalks. From a low or high PSI to the size and look of aggregates, we help you determine the proper custom mix design ingredients best suited to your project. In addition, we meter the amount of concrete yielded from the volumetric mixing truck so that you are only charged for the materials you use. Short Load Concrete has the largest fleet of volumetric concrete mixing trucks in Southern California. Our extensive fleet allows us one of the fastest response times in the industry. We are able to travel to almost any job-site across Los Angeles County, Orange County, and the Inland Empire on a moment's notice. Our priority is customer satisfaction, and we work rapidly and efficiently to meet and exceed your concrete delivery needs. Unlike ready-mix concrete trucks which run the risk of delivering a "hot load" to your site and thus causing you to rush your concrete pour, volumetric mixing trucks deliver raw concrete materials that are mixed on site, allowing for a much longer standby time. No matter the scope or size of job, our experienced drivers will deliver and freshly mix the concrete you need. Each of our trucks are fully calibrated and regularly monitored to ensure correct batching and yielding. We offer 24 hour radio dispatch, 7 days a week, every day of the year. We are a fully licensed and insured business and are conveniently located in Anaheim. Call us today for your free short load concrete delivery estimate. We look forward to assisting you!